Quarterback Teven McKelvey rushed for four touchdowns to lead Gardner-Edgerton to a 27-21 victory over Olathe East. McKelvey finished with 174 yards on the ground to help his team to improve to 4-0 for the first time in eight seasons. Under new coach Ryan Cornelsen, Gardner-Edgerton is the lone remaining undefeated team on the eastern side of Class 6A despite entering this season having lost 10 straight games. Olathe East was led by quarterback Hunter Thomas who threw three touchdown passes. After building a 28-0 lead at halftime, Garden City had to knock down a Hays High Hail Mary on the game’s final play to preserve a 35-28 win. The Buffs were led by junior quarterback Carlos Acosta who rushed for 140 yards and three touchdowns on 35 carries. Acosta also completed 5 of 7 passes for 96 yards including touchdown passes to Tye Davis and Kaleb Lapointe. 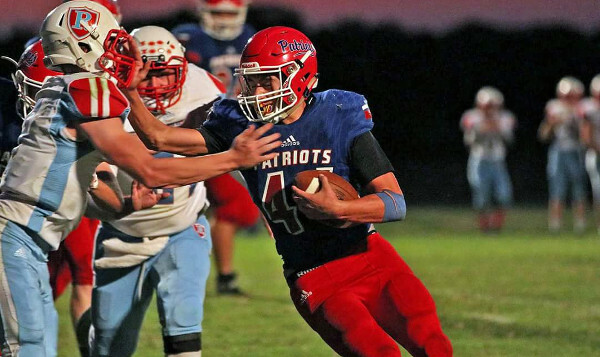 Hays frantic comeback was led by quarterback Palmer Hutchinson who passed for two scores and rushed for two scores in the second half. Olathe South outscored Shawnee Mission South 24-7 in the second half in pulling away for a 54-24 victory. The Falcons led the Raiders 30-17 at halftime. Sophomore quarterback Reed Smith, filling in for injured starter Evan Foster, passed for 157 yards and a touchdown for Olathe South. Sophomore Andrew Nehrbass rushed for 209 yards and four touchdowns on 29 attempts. Roman Mahoney, another sophomore, and junior Blaize White also added touchdown runs for Olathe South. Shawnee Mission South was led once again by senior quarterback Jack Roberts who passed for 182 yards and two scores, and rushed for 104 yards and a touchdown. Wichita South edged Wichita East, 21-20 on Friday. Antwain Scales rushed for 50 yards and scored two touchdowns to lead the Titans. Quarterback Jashun Grant also passed for 71 yards and threw a touchdown pass to Damion Wells. Defending champion Blue Valley North picked up its first victory of the season in a 52-42 shootout over Blue Valley West. The Mustangs led Blue Valley West 21-14 at halftime and outscored Blue Valley West 31-28 in the second half. Freshman quarterback Henry Martin completed 21 of 30 passes for 288 yards and five touchdowns to lead the Mustangs. Martin connected with Cameron Burt five times for 140 yards and three scores, while Amauri Pesek-Hickson caught nine passes for 106 yards and two touchdowns. Pesek-Hickson also added 127 yards and a touchdown rushing. Greg Riddle passed for 266 yards and four touchdowns for Blue Valley West, while Abe Lawrence rushed for 153 yards and two scores. On Thursday night, Wichita Heights scored 47 first-half points in beating Wichita North, 64-22. Heights’ senior K’Vonte Baker rushed for 209 yards and four touchdowns on only seven carries. Amaad Hubbard added 134 yards and two scores on eight carries, while Joshua Sanders chipped in 125 yards and two scores on five attempts. North was led by junior Joe Williams who rushed for 207 yards and two touchdowns. Williams has totaled 812 rushing yards and six scores through four games this season. Great Bend rushed for more than 250 yards in pulling away from WAC rival Dodge City, 35-15. Dalton Miller rushed for a touchdown an returned an interception 87 yards for another score to give the Panthers a 14-7 lead at halftime. Miller caught a short touchdown pass from Koy Brack in the third quarter, and Brack added a pair of fourth-quarter touchdown runs to allow the Panthers to pull away. Emporia handed Topeka Seaman a second consecutive loss, 28-6 at Welch Stadium. Spartan quarterback Jace Stewart rushed for 76 yards and two touchdowns. Stewart also passed for 91 yards and another score to Spencer Stewart, who caught five balls for 90 yards. Seaman managed only two field goals by Brock Hillebert. Kapaun Mount Carmel held off Andover, 33-26, to improve to 4-0 on the season. The Crusaders scored twice in the third quarter to build a 33-19 lead and held off the Trojans. Scott Valentas rushed for 76 yards and three touchdowns to lead the Crusaders. Quarterback Jarius Kennedy passed for 125 yards and a touchdown to Jacob Schmitz. Schmitz caught six passes for 102 yards. Topeka West dominated from the start in a 56-2 victory over Topeka Highland Park. Ja’Juan Benson returned the opening kickoff for a touchdown and the Chargers didn’t let up after that. Clifton Hollomaon led West with 125 rushing yards and two touchdowns. Towanda-Circle snapped a 19-game losing streak with a 20-10 victory over Rose Hill on Friday night. The T-Birds trailed the Rockets 10-6 until the fourth quarter when Corbin Ingrim scored on a 26-yard touchdown run to give Circle a 12-10 lead. Luke Myers then tacked on a late touchdown run and Easton Barrier’s two-point conversion pushed Circle’s lead to ten points. Myers passed for 138 yards in the game and rushed for two scores. Louisburg traveled to KC Piper and won a mistake-filled battle of unbeaten teams, 28-21. Piper scored on the game’s first play on a 69-yard touchdown run by Dalton White, but Louisburg would answer on a touchdown pass from Madden Rutherford to Josh Casey to pull within 7-6. An Austin Moore’s TD run gave Louisburg a 14-7 lead and a blocked punt had the Wildcats in good position again. But a fumble deep inside Piper territory was picked up by Brandon Snell and returned 89 yards for a score to tie the game. Rutherford then hit Braydon Gage for a touchdown late in the second quarter, then hit Brandon Copper for another TD pass in the fourth quarter to give the Wildcats a lead they would not relinquish. Andover Central evened its record at 2-2 with a 27-17 victory over Valley Center. The Jaguars led 21-17 at halftime and held on with a score in the fourth quarter. Junior quarterback Shomari Parnell passed for 204 yards and two touchdowns. Parnell tossed scoring passes to Xavier Bell and Matthew Macy. Parnell also added a touchdown run as did R.J. Bethea. Valley Center was led by Larry Wilson’s 113 yards rushing on 29 carries. Wilson also caught five passes for 111 yards and a touchdown. The Atchison Redmen rushed for six touchdowns in beating KC Harmon, 47-8. Atchison was led on the ground by senior Sercy Duncan’s 133 yards and two scores on 13 carries. Garyeon Simpson also rushed for two scores, while Braydon Dame and Xavier Cushinberry each added scoring runs. The Redmen defense held Harmon to 17 yards of total offense and minus 31 yards rushing. Quincy Adams scored on a 7-yard run for the Hawks lone score. Chapman rushed for 257 yards in shutting out Clay Center, 20-0. The Irish were led by senior Dalton Harvey who rushed for 182 yards and two scores. Chance Liebau added the other Chapman touchdown run. Burlington took a big step in securing at least a top two finish in District 2 with a 34-12 victory over Girard. Senior Brannon Nordstedt rushed for 121 yards and two touchdowns on 32 carries, while Cael Johnson added 94 yards and two scores on 11 carries. Burlington rushed for 294 yards in the game. Nordstedt also passed for 57 yards and a touchdown to Brennan Brown. Halstead scored 24 points in the first quarter and 20 more in the second as part of a 52-16 district victory over Rock Creek. Junior Scott Grider led the Dragons with 155 yards and four touchdowns on 18 attempts. The Dragons rushed for 384 yards in the game. Sophomore Lakin Farmer was second on the team with 84 yards on five attempts. Halstead will travel to CKL rival Hesston this week in another key game in District 5. Smoky Valley shutout Hesston 28-0 to pick up a key win in the loaded District 5. The Vikings used a strong performance from its offensive line that paved the way for 279 rushing yards – led by Tim Lambert’s 112 yards on 22 carries. Quarterback Lane Schrag passed for 111 yards and threw touchdowns passes to Lambert, Trey Kennedy, and Blake Heble. Schrag also added a touchdown run. The Vikings will travel to winless Clay Center this week. Staying in District 5, Nickerson’s Tanner Schrag had a part in four touchdowns as the Panthers topped Holcomb, 27-7. Schrag rushed for three touchdowns and passed for another to lead Nickerson to its first victory of the season. The Panther defense limited Holcomb to a Peyton Ortner short touchdown run in the first quarter. Quarterback Bo Gooch scored on a 4-yard touchdown run with ten seconds remaining and Eli Wiseman converted the PAT to lift Belle Plaine to a 41-40 victory over Cherryvale. Gooch connected with Wiseman six times for 193 yards and three touchdowns on the night. Tristan Warren also caught seven passes for 87 yards and two scores. Gooch passed for 345 yards and five touchdowns on the night with two interceptions, and an interception on the Dragons’ final drive would have ended the game in favor of Cherryvale but was ruled incomplete. Cherryvale was led by Garrett Novotny’s 202 rushing yards and four touchdowns on 25 attempts. Hoisington (3-1) rolled over Thomas More Prep, 42-0, with all of its points coming in the first half. Hoisington scored on all six of its first half possessions before a running clock in the second half. Wyatt Pedigo had 10 carries for 170 yards and a pair of scores. TMP (1-3) had just four first downs and has tallied 20 total points this year. Derek Boxberger threw for 126 yards with a passing score and a rushing TD. Lakin rolled for a 47-0 victory over Ellinwood. The Broncs led 24-0 after the first quarter, 40-0 at halftime and scored the final touchdown in the third. Juan Banuelos and Kayden Christiansen each had two rushing TDs. J.P. Perez returned a punt 70 yards for a TD. The 4-0 Broncs held a 305-118 yardage advantage. In what was expected to be a key district showdown, Humboldt easily beat Jayhawk-Linn, 73-0. Conor Haviland and Dagen Goodner both exceeded 100 rushing yards, and Haviland picked up an interception. Humboldt finished with 18 TFLs. David Watts and Tucker Hurst each delivered three tackles for loss. Southeast-Cherokee beat Northeast-Arma, 27-6, and moved to 3-1 after the Lancers ended a 28-game losing streak in Week 1. Brett Malle had 148 rushing and a score and completed 6 of 15 passes for 155 yards and a touchdown. Northeast has dropped 25 straight games. Minneapolis (3-1) matched its number of victories from the last three years and is guaranteed to improve its win total for the fourth straight year. In its district opener, the Lions defeated Ellsworth, 14-13, its second OT/one-point win this year. Ellsworth led 7-0 early and 13-7 entering the fourth quarter a 66-yard pick-six. Minneapolis had a 4th-and-14 from Ellsworth’ 30-yard line before Derek Freel found Kaden Griffin on a 25-yard pass to the 1-yard line. The Lions faced fourth-and-goal from the 8-yard line. With 7:46 left, Freel threw a touchdown pass. Ellsworth missed a 34-yard field goal with just under a minute left. Freel was 4 of 8 for 46 yards and a score, and finished with 20 carries for 79 yards and a touchdown. After an injury-plagued 0-3 start, Ellis won at La Crosse, 44-34, in the first of two meetings between the squads. The teams will meet up in Ellis in Week 8. Ellis has scored just 32 points in the first three weeks, and La Crosse, with a non-senior heavy roster, was 2-1. Cade Lewis scored on runs of 14, five and 54 yards and caught a 15-yard scoring pass. Ellis led 15-0 before La Crosse came back and took the lead. Then, Auntonio Jones responded with an 85-yard kickoff return before the Leopards scored again and led 28-22 at halftime. Jones added a 72-yard receiving score in the third quarter. Syracuse defeated Sublette, 46-14, with a 23-0 lead at halftime. Junior Damian Ramirez finished with six rushes for 40 yards and three scores. He also had a 24-yard reception. Edgar Gonzalez rushed 23 times for 282 yards and a pair of TDs. Meade knocked off Stanton County, 48-0. The Buffs scored on the opening kickoff, and Korben Clawson tallied three TDs and Jarret Stapleton scored twice. Greyson Haynes also delivered a 48-yard scoring run. Meade held a 198-49 yardage edge. Hillsboro continued its strong start and already has two more wins than last season’s 1-8 mark. The Trojans defeated Sacred Heart, 45-31. Hillsboro scored five times in the first 12 minutes, 12 seconds of the game. In the flurry, Jorge Hanschu threw a 73-yard touchdown pass and an 84-yard scoring pass. Dillon Boldt recorded a 28-yard pick-six. Hillsboro led 33-7 12 seconds into the second quarter before Sacred Heart tallied 17 straight points. Early in the fourth, Hanschu threw a 70-yard scoring pass. Northern Heights scored 28 points in the second quarter to pull away for a 40-8 victory over Yates Center. Marcus Waters threw four touchdown passes to lead the Wildcats to their first victory. Cameron Heiman caught two of Waters’ touchdown passes and rushed for two more scores. Yates Center scored on a short Thayne Smith touchdown urn in the fourth quarter. Victoria rolled over Lincoln, 52-0, ahead of its key road showdown versus Clifton-Clyde this week. Jayvon Pruitt had 76 rushing yards and two scores. Jake Wellbrock scored from 64 yards out on a punt return, whole Tyler Knoles delivered a seven-yard interception return for a score. Knoles and Cooper Windholz had rushing touchdowns. The game ended at halftime as the Knights moved to 3-1. WaKeeney-Trego bumped to 3-1 and matched last year’s win total with a 58-12 victory versus Atwood-Rawlins County. Kobi Shubert had 184 passing yards and three scores, and Dallas Schneider had nine carries for 108 yards and two TDs. The Golden Eagles led 22-12 at the end of the first quarter and scored 30 in the second quarter before they ended the contest in the third. WaKeeney gets a key matchup at home versus Leoti-Wichita County this week. In a key District 1 matchup of undefeated teams, Sedan held off Oswego, 38-34. Oswego junior Jace Wilson had 26 carries for 136 yards and a pair of TDs. He also passed for 61 and rushed for 63. Oswego finished with 244 rushing and 127 passing yards. Caldwell defeated Argonia-Attica, 32-12, in a key District 2 matchup. Caldwell led 26-0 at halftime. In the first half, Corbin Rice and Dru Volavka each scored twice. Taylor Lamb blocked a punt that helped lead to a TD. Caldwell had a 293-175 edge in total yards. Rice had a big game with 11 of 22 passing for 113 yards, along with 24 carries for 106 yards and a pair of TDs. Central Burden picked up a key victory in District 1 winning at West Elk, 44-36. The Raiders and Patriots were tied 22-22 at halftime until Central Burden scored twice to lead 38-30 after three quarters. Each team scored once in the fourth quarter for the final margin. West Elk was led by junior Nic Moreno’s 210 rushing yards. Moreno rushed for a touchdown and caught two touchdown passes totaling 55 yards. Thunder Ridge moved to 3-1 with a key 24-14 home district win against Northern Valley. The Huskies had opened 3-0 and scored 50, 62, and 48 points a contest. Northern Valley led 14-6 at halftime before the Longhorns, under first-year coach Joel Struckhoff, tallied 12 in the third quarter and six in the fourth. Sophomore Jacob Barnes was 5 of 9 passing for 126 yards with two touchdowns. Senior Brandon Grauerholz finished with 22 carries for 141 yards and a pair of touchdowns. Landon Gering hauled in a pair of receptions, both for scores. Logan-Palco bumped to 2-2 with a 52-6 home victory versus Wilson. Freshman quarterback Dylan Van Laeys completed 4 of 7 passes for 125 yards and three TDs, one apiece to juniors Gabe DeBoer, Cody Brown and sophomore Micah Thompson. Brown rushed 10 times for 47 yards and a TD. All but six of the offensive yards came from non-seniors. Logan-Palco forced six turnovers, led by a pair of interceptions from junior Zach Jansonius. Frankfort opened 4-0 with a 52-0 road victory against Wetmore. The Wildcats have permitted just 24 points this season and have already matched last year’s win total. Carson Schreiner delivered a 55-yard punt return, his fourth of the year. Frankfort’s defense held Wetmore to 31 plays for 83 yards and picked off two passes. Waverly defeated Marais des Cygnes Valley, 58-14. Drew Pyle threw for 147 yards and five scores. Weston Patterson and Jake Newton each tallied two receiving TDs. Waverly (3-1) plays host to 3-1 Centre-Lost Springs in a matchup that will likely decide District 2. Kail Dubbert rushed for 218 yards and five touchdowns to lead Beloit St. John’s-Tipton to a 46-8 victory over Southern Cloud. Brayden Perez added 137 yards and a touchdown on the ground for the Blujays. Blake Gumm led Southern Cloud with 185 yards and a score on 14 carries. Golden Plains outscored Cheylin, 92-47 on Friday night to remain unbeaten. Seniors Dylan Spresser and Caleb Korte each rushed for five touchdowns to lead the Bulldogs. Spresser delivered 295 yards rushing on 20 carries, while Korte added 209 yards on 16 attempts. Cheyline was led by sophomore quarterback Colton McCarty who passed for 216 yards and four touchdowns, and rushed for 181 yards.